Bright, bold, and detailed, much of the Central and South American street art that I have seen appear to be quite elaborate. 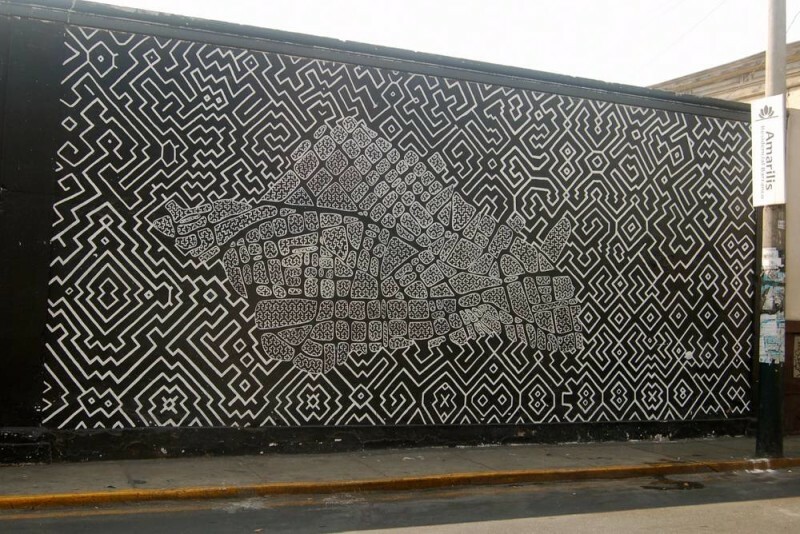 This is the third in a series of collaborative posts on street art around the world. The first was European Street Art followed by Canadian and American Street Art. What I find most interesting so far are the similarities. Take a look and see if you agree. The first is one I shot myself in Cartagena, Colombia and most of the rest are from other travel bloggers. 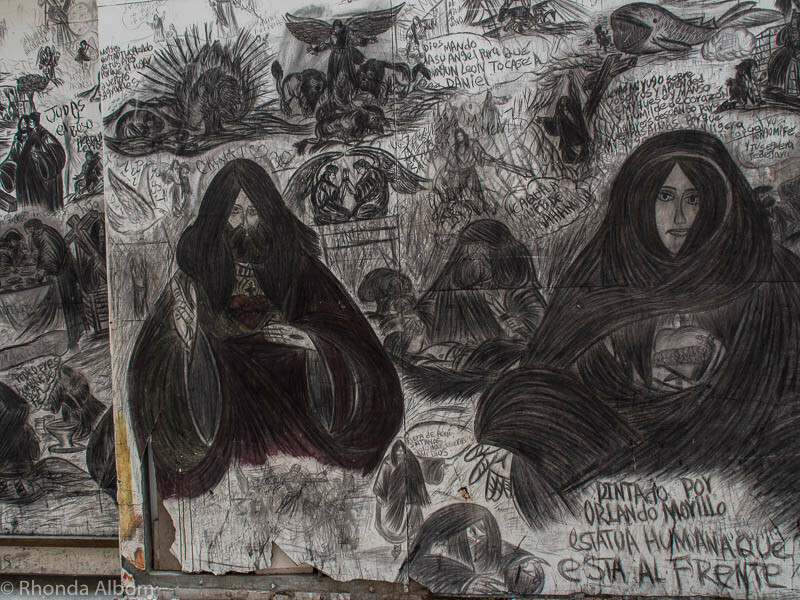 This is a small section of a wall filled with mostly black and white street art in Cartagena’s old town. With only one day to explore the city, we didn’t have time to find much South American street art. See more at Highlights of Cartagena Colombia in a Day. 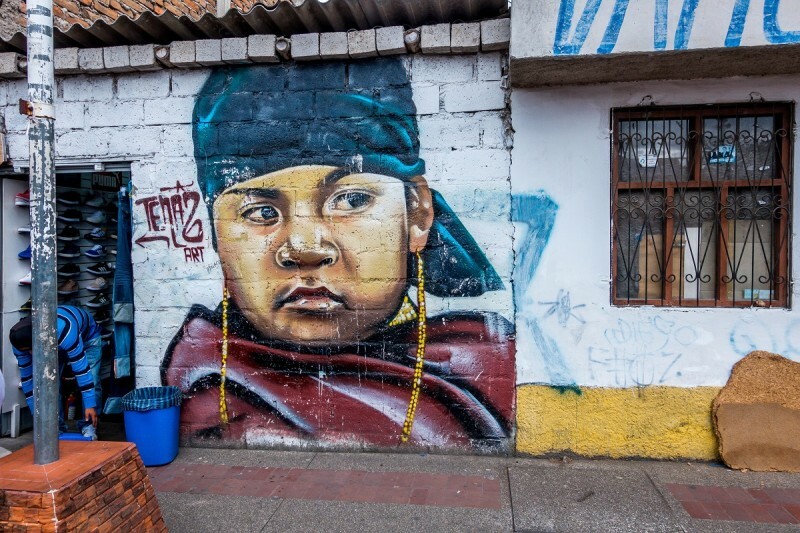 There’s a saying, “There’s no white walls in Ecuador.” We found that to be particularly true in Otavalo, a traditional community known for its Saturday trading market. You find incredible works of art on the streets of Cuenca, Ecuador. The city has actually commissioned many pieces and allows specific areas for street artists, so you can actually watch painters working in the middle of the day, instead of under the cover of night. Nicaragua is not the hotbed of street art in Central America, however, there is one mural which should be credited in Leon. This political street art story takes you through the passage of time displaying the main events in Nicaragua’s history, concluding in utopia – children skipping into the distance with an iconic volcano in the background. We were introduced to this street art during the revolution tour. Personally, I think this tour is one of the top things to do in Leon. There is also a pretty funny rendition of London’s Banksy, which we found on the backstreets of the city. Photo contributed by Two Scots Abroad. 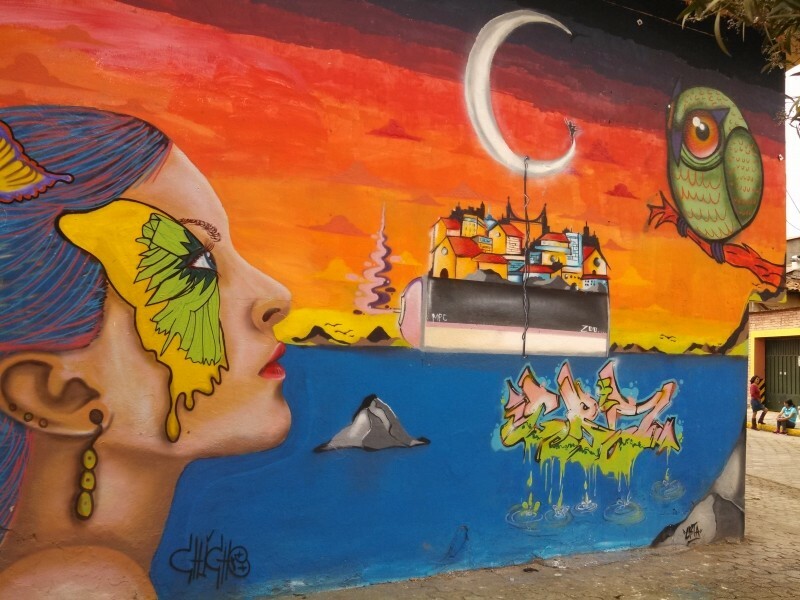 Bogota has some of the world’s most striking street art; this is a city where graffiti is not illegal, and artists compete with each other to fill every available space with weird and wonderful designs. Photo contributed by Will Hatton of The Broke Backpacker. See more at Backpacking in Colombia. Valparaiso in Chile is not only famous for its unique old houses, clustered on steep hills, overlooking the port. 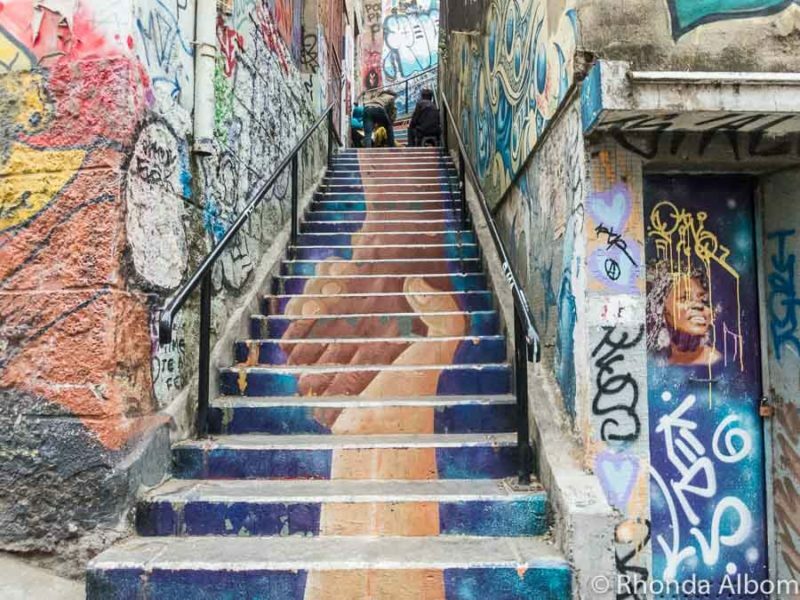 During the last decade, the World Heritage listed city has gained international reputation as a hotspot for street art. Everywhere you turn you find excellent works of colorful art on public walls; from intricate, very detailed, almost whimsical pieces to very bold graffiti covering large, previously barren walls. 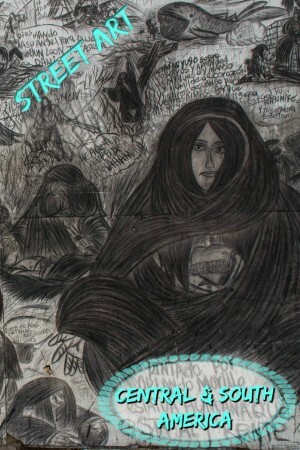 You can see a lot of street art when you join one of the walking tours. Dare2go has created a self-guided street art walk, which takes the visitor past many excellent pieces along the fringe of the town center – not covered by city tours. Photo contributed by Juergen of Dare2go. I finally made it here, and took this shot along with many others. See the best of my Valpo street art here. Several internationally renowned street artists come from Brazil. The medium is well recognized as part of the design world. 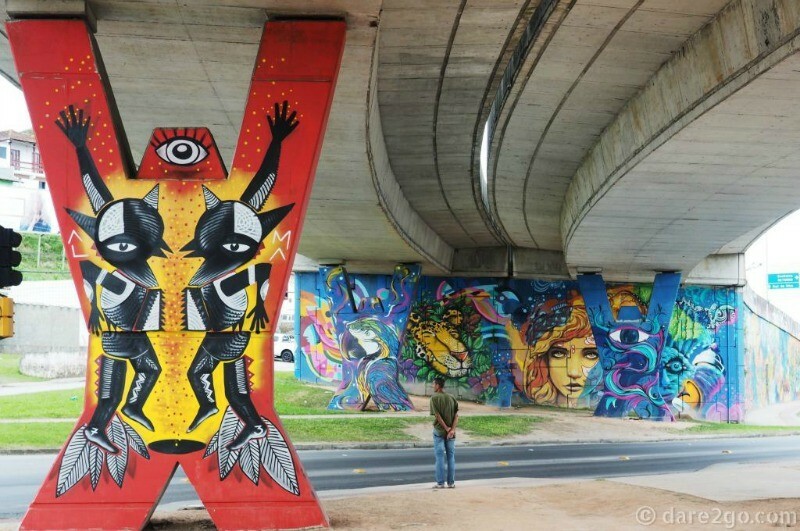 Hence, it comes as no surprise that, as part of the Design Biennial in Florinanopolis in 2015, a long road overpass near the airport was transformed by a group of over 30 street artists. They turned a previously unsightly gray concrete structure into an explosion of color and styles. It’s well worth a visit (or at least a stop on the way from/to the airport) if you are interested in different styles of contemporary street art in one very compact space. Photo contributed by Juergen of Dare2go. See more at An Explosion of Colour Instead of Dull Grey Concrete. Did you find this Central and South American street art to be somewhat more elaborate than other street art you have seen? Those are really beautiful. I am guessing by the intricacy that they took a long time to carry out which tells me they were made with the support of the local towns/cities? I would imagine so, but I have no idea. I was pretty impressed with what was sent in too. I agree. I am impressed by so much art around the world. What a unique texture happening on that carved maze! The blogger who sent that one in always finds the most unusual things. Wow! What amazing examples of street art. They are so beautiful and moving. I can’t wait to visit South America. Your shot I found to be more elaborate but the others with vibrant and political themes I thought had a commonality with other great street art. I love that you’re doing this, did I mention that already? The entire wall we found in Cartagena was elaborate like that. These posts have been so interesting. To see the similarities yet the differences is intriguing. I think that is why I am having so much fun pulling them together. Amazing street art recap!! I’m a fan! There is still more to come in the series. 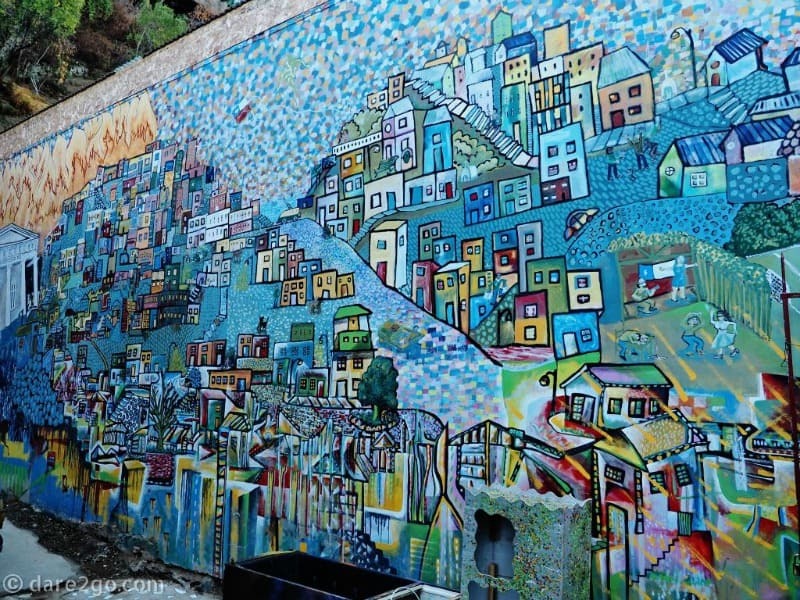 I hear lots about Chile street art – another place to add to my list! Thanks for featuring us. I am looking forward to several months in South America next year. 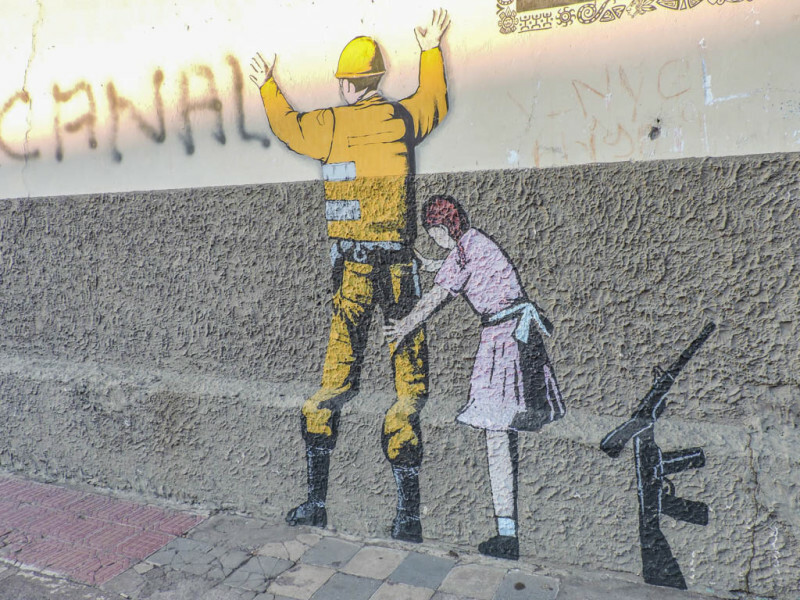 There is a lot of great street art in South America, I love the ones you highlighted! Thanks. 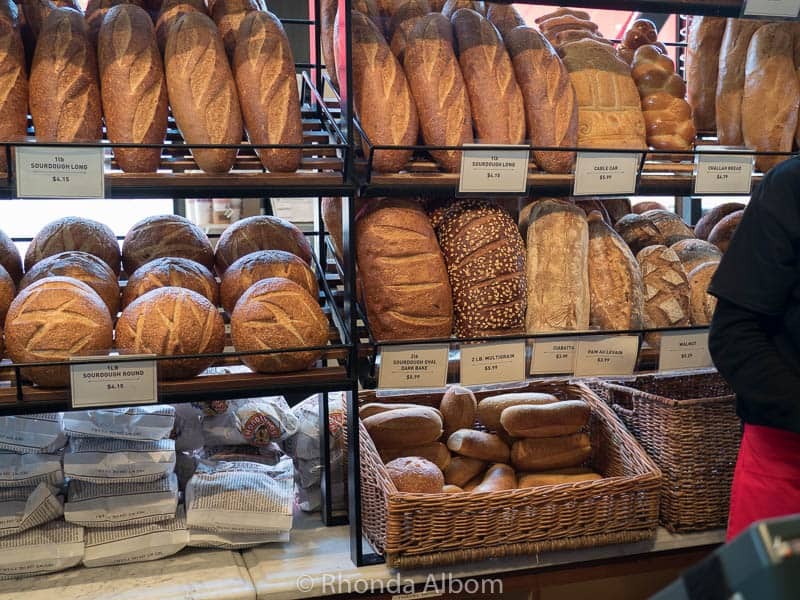 I can’t really take too much credit for the selection, as most of it was sent in by other travel bloggers. This turned out great! I’m glad to have been part of this. Funnily: in both cases you picked the photo I wasn’t so sure about. Thanks Juergen. We all have different taste, but my favorite of all that you showed me were the support columns. I think it was their difference from other things out there. Some of this is pretty cool. Some not so much. It’s just so original. You wouldn’t see anything like it in an art gallery. Like the one of the rockin’ dragon with his tail continued on the building behind. Very true, but I wonder why modern galleries don’t include it. I love the bright colors too. 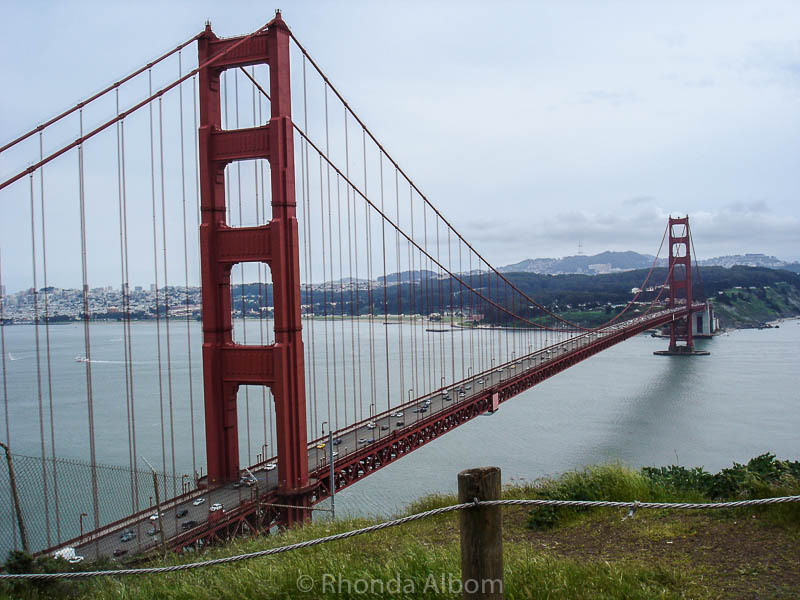 I can’t wait to visit next year. 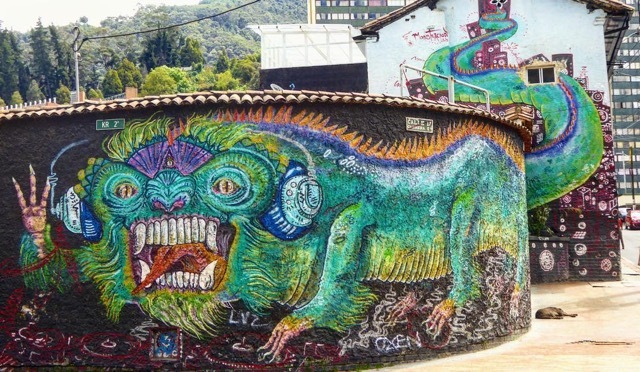 South America really seems to be the hot spot for street art right now. I’ve seen so many beautiful pieces from Chile all over the blogosphere lately that I’m really tempted to visit the country myself! LOL – me too. In fact, I am planning for South America early next year. Rhonda these are amazing, I just love street art and unfortunately haven’t been to any of the places you featured. I am so drawn to the Ecuador and Chile pictures as I’m a huge fan of colour. Perth has it’s fair share of vibrant and intriguing street art and I love photographing it. Great post. I haven’t been to many of them either, only Cartagena Colombia. I am also drawn to the Ecuador photos and plan to visit there next year. Thanks Hilary, and wish I could take credit for the book idea, but I cannot. Me too. I am so impressed that people can paint things so large, and be able to visualize the outcome, and then achieve it.